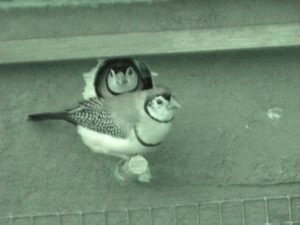 My pair of Owl Finches started breeding in June 2001. I did nothing special. 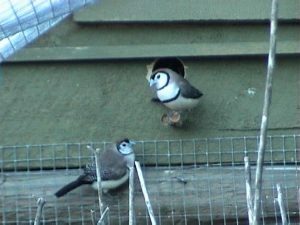 Merely provided them with a nest box facing the morning sun. They did the rest. 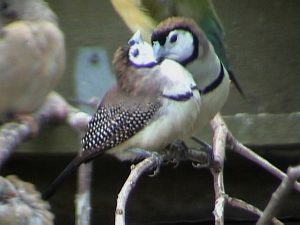 Prior to breeding I noticed that the male was more attentive and they were constantly preening one another. 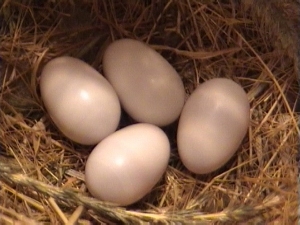 The eggs are very different in shape and size to what I was use to compared with the Gouldians. 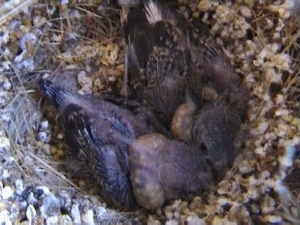 The nestlings were the same, looking like Gremlins from the movie! They were covered in fine hair sticking straight up on end as if they had been electricuted. When I first saw them I thought they had died and had mould growing all over them! 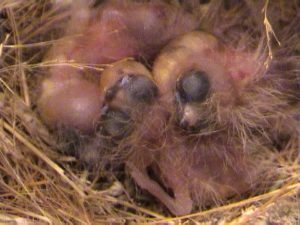 While the nestlings were growing I noticed the parents became very insectivorous. 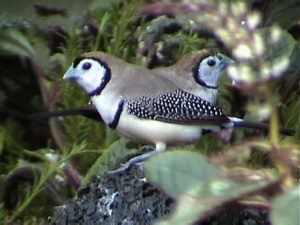 In my aviary that is not a problem as there are shrubs available attracting insects, fallen leaves and plenty of dirt as well as grass. My pair successfully raised two offspring. When they fledged they were instantly agile flyers. Unfortunatley after they coloured up my darling 5 year old son accidentially assisted them in escaping from the aviary never to be seen again. 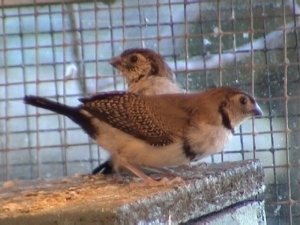 Fortunately they produced another two young ones in January 2002. I have placed some thumbnail pictures below that you can enlarge showing what I have experienced with my great little pair of Owls, affectionately named, Mr and Mrs Jones. 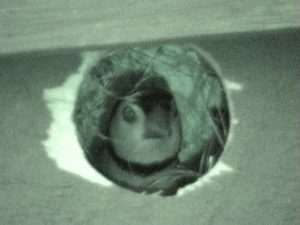 The male retires last almost in the dark and keeps watch before putting his head down low like the female.